Nestled in the shadow of the University of Maryland Medical Center, the Hollins Market neighborhood is a short commute from Downtown Baltimore. It’s just south of the row house that poet Edgar Allan Poe called home in 1834, and just north of the popular Baltimore & Ohio Railroad Museum. The neighborhood is the namesake of one of Baltimore’s six public markets. A city councilman lives there. It’s also the home to dozens of Baltimore’s 17,000 vacant buildings, a methadone clinic and a a persistent homeless population. Because of its proximity to Downtown, the neighborhood has appeared ripe for renovation for decades. Neighborhood residents especially took notice when Scott Plank, the brother of Baltimore’s Under Armour CEO Kevin Plank, purchased more than 30 properties in the neighborhood last year. Despite all the speculation, not much seems to be changing at street level. The market is a hive of activity on a Saturday morning, but there are still vacant, boarded up buildings across the street. Appearances can be deceiving. A closer look reveals the Hollins Market neighborhood is changing, although not in the dramatic fashion of the wholesale makeover envisioned by Under Armor a few miles away at Port Covington. Take for example the story of the three Roberts who live and work at 1100 Hollins Street, a three story brick row house at the corner of Hollins Street and Arlington Avenue. 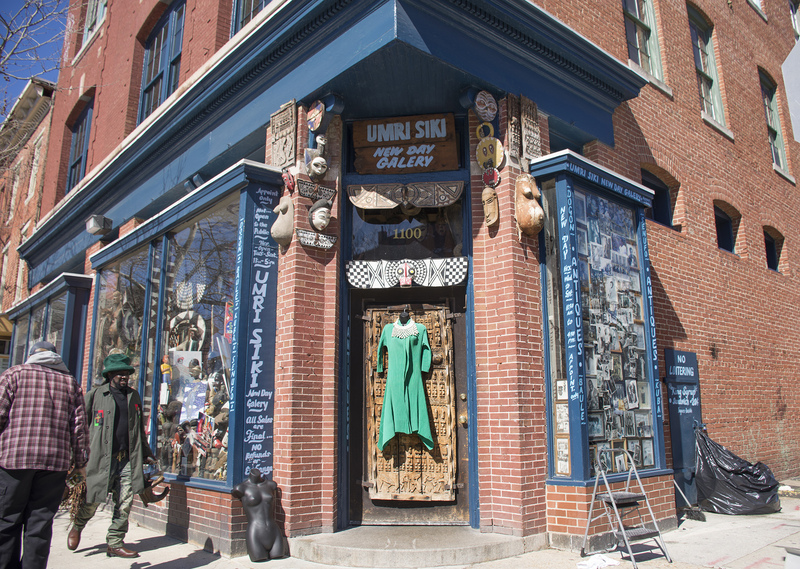 Robert Williams runs an art gallery, Umri Siki, on the ground floor of the building at 1100 Hollins. He is a familiar sight when the weather is good as he sets up displays of exotic African masks, fragrance, clothing and art on the sidewalk in front of 1100 Hollins. 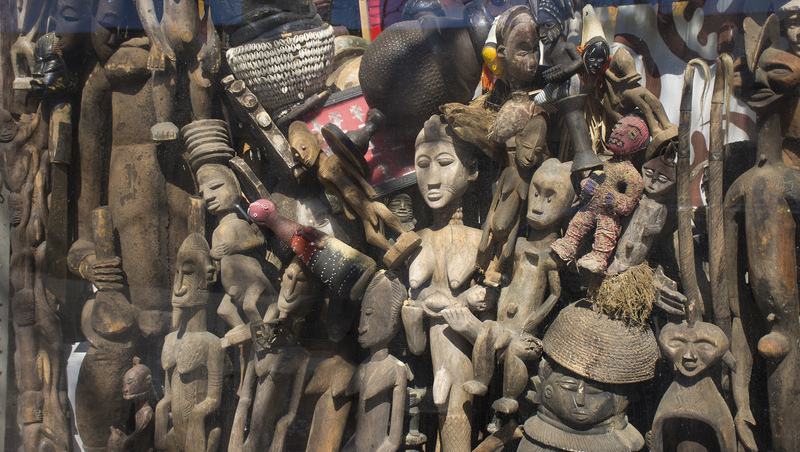 The windows of his gallery are packed with African sculptures and collectibles. 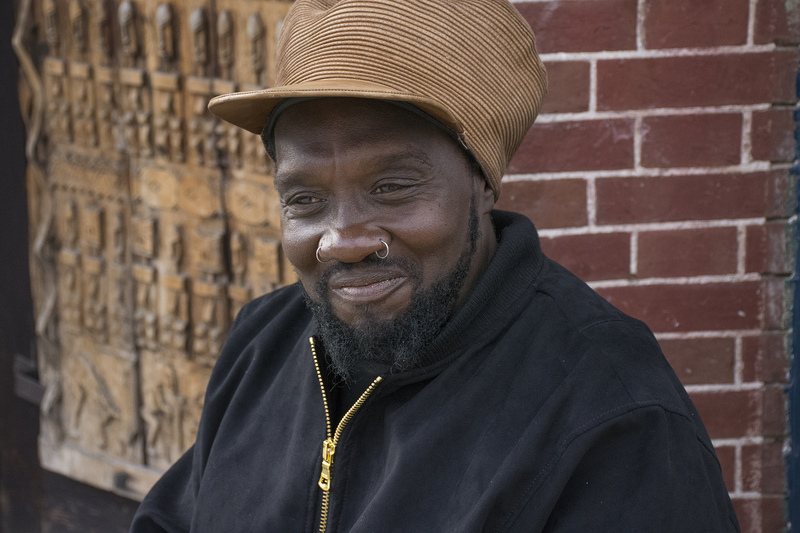 With an international reputation as an art collector and musician, and with his long dreadlocks tucked under a hat, Robert Williams is known in the neighborhood as African Robert. 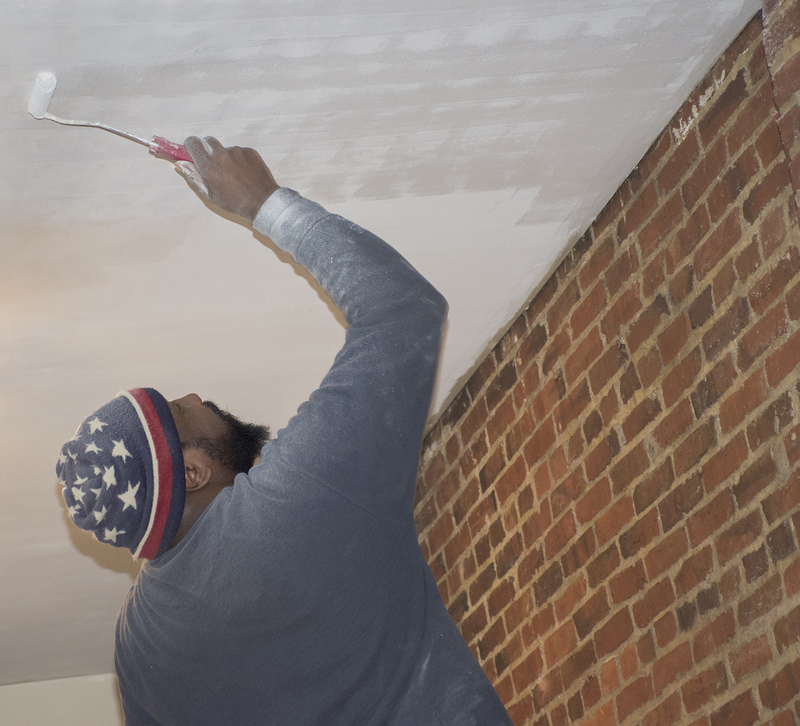 Out of public view, on the second floor of the building, Robert Lee Jr. is painting a refinished ceiling. He doesn’t live at 1100 Hollins. His apartment is a few blocks away. But his landlord owns both buildings and this Robert is trading his labor for rent. 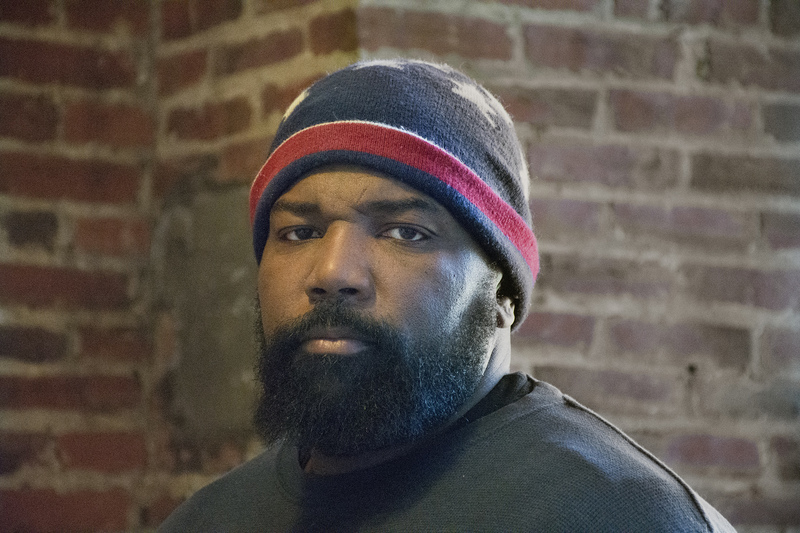 Robert Lee Jr. has a reputation in the Hollins Market neighborhood for being a capable handyman. The renovation work is a second job for him. His day job is working a a bartender and server at Mr. Ranchito, just up the block at 1116 Hollins Street, a restaurant that has a city-wide reputation for Mexican and Honduran food. 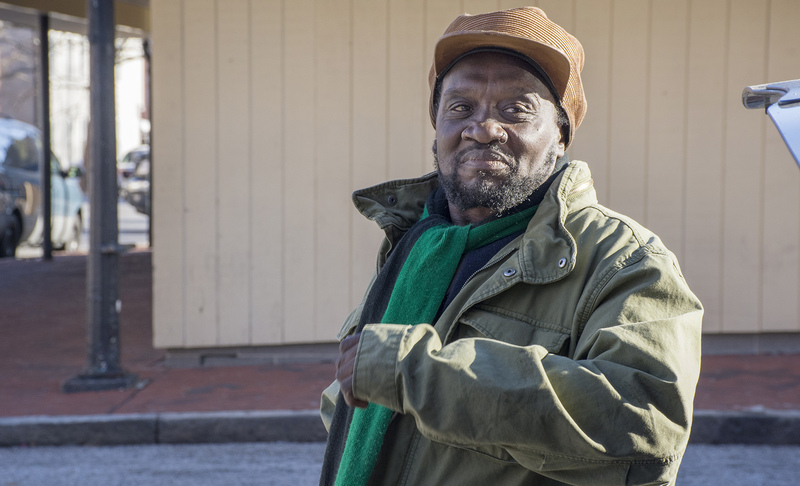 In the Hollins Market neighborhood this Robert, named after his father, is known as Junior. He knows the Hollins market area has seen better days. But he is proud of this neighborhood where he has lived and worked for many years. Above the apartment Robert Junior is working on, the third floor of 1100 Hollins is laid out in classic New York City loft style. This apartment — actually the whole building — belongs to a third Robert. His full name — Robert Meyer. 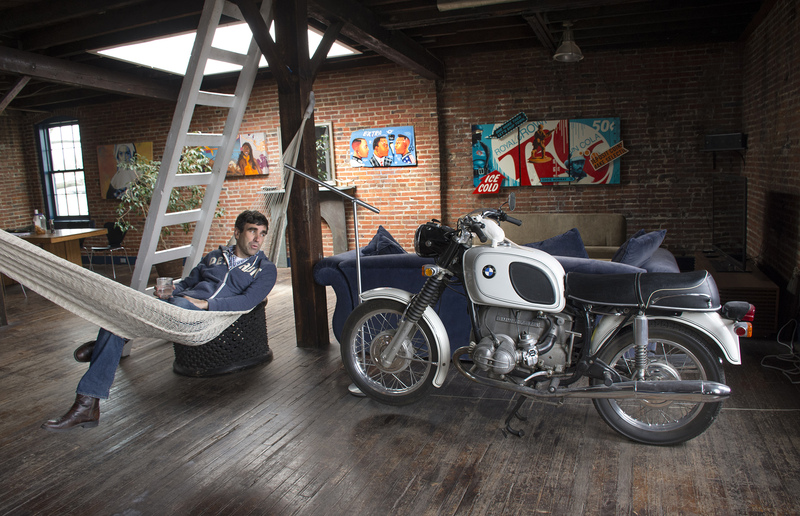 The loft has an open floor plan, weathered hardwood floor, exposed brick and beams, eclectic artwork on the walls and even a classic BWM on display in the living room next to the hammock. This is exactly the way the third floor Robert wanted to live in New York, except the price tag was too high. 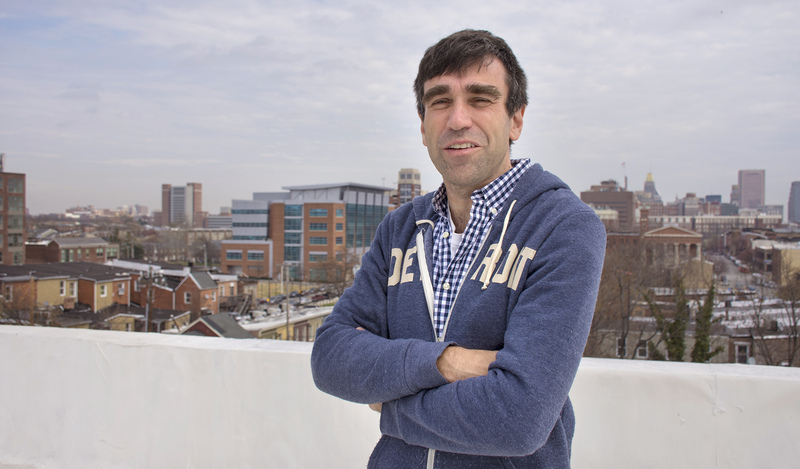 He set his sights south and discovered Baltimore’s much more reasonably priced real estate — and the Hollins Market neighborhood. 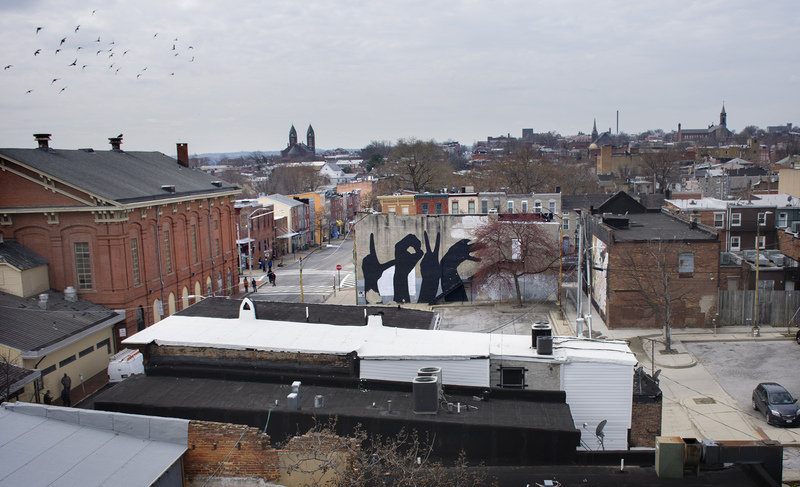 From the rooftop of 1100 Hollins, looking west, Hollins Market is across the street and a sign language mural is straight ahead. Looking the other direction reveals how close Robert Meyer’s loft and Hollins Market are to the brick and glass of the University of Baltimore BioPark complex, and to Downtown beyond. 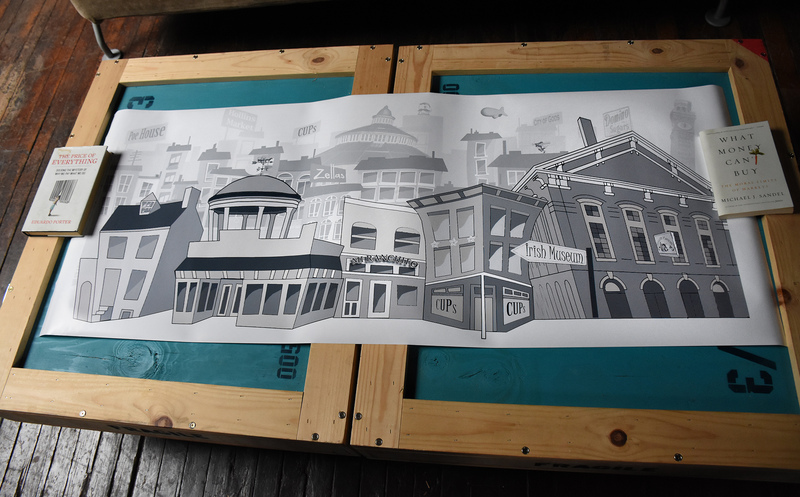 Inside the loft, the artwork shows that while New York was the inspiration, the Robert on the third floor — known to his neighbors as Fancy Robert — has embraced Baltimore culture. 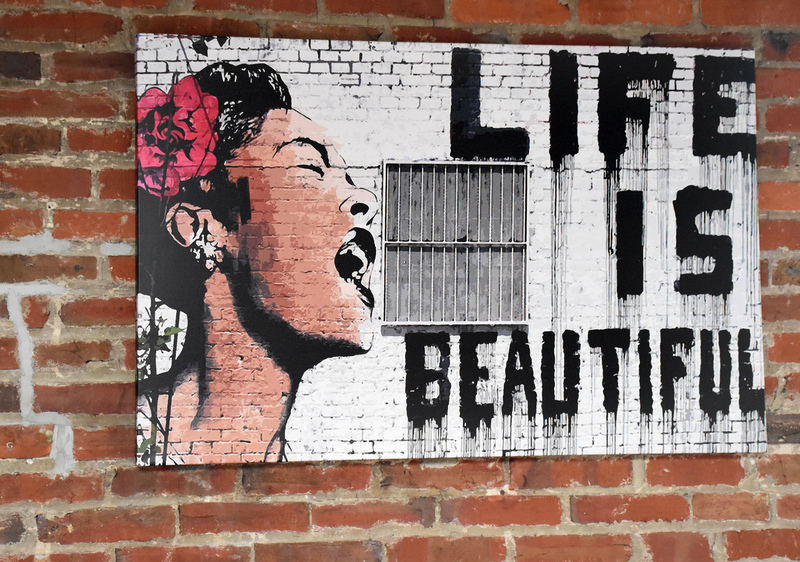 On one wall he displays a print of the famous “Life is Beautiful” image of legendary Baltimore jazz singer Billie Holiday that was created by the British graffiti artist Banksy. 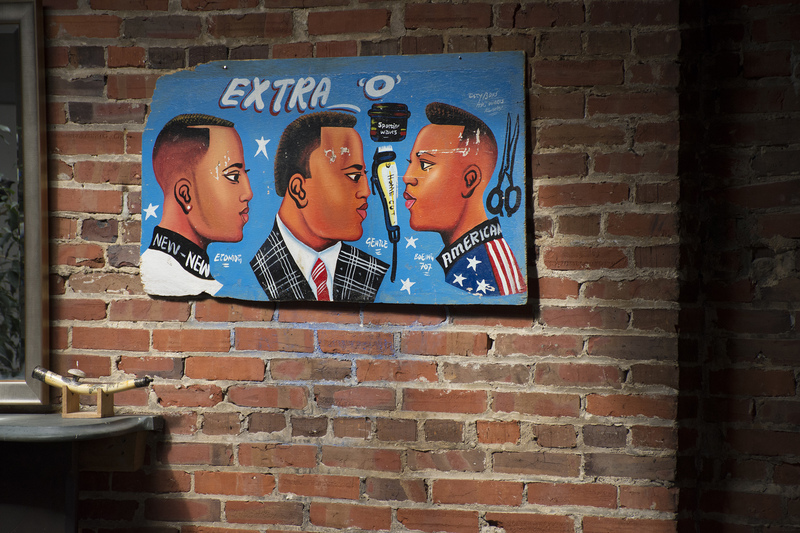 On another wall is artwork acquired from neighbor Troy Staton, whose New Beginnings barbershop and gallery across the street is famous for the African-American art that Staton collects and displays on its walls. From his third floor loft, Fancy Robert has plans for the amenities Hollins Market could offer. This vision is not just talk. He has invested in other buildings in addition to 1100 Hollins. But Fancy Robert has a little Practical Robert in him. He says it is important to invest in the neighborhood’s people, too. 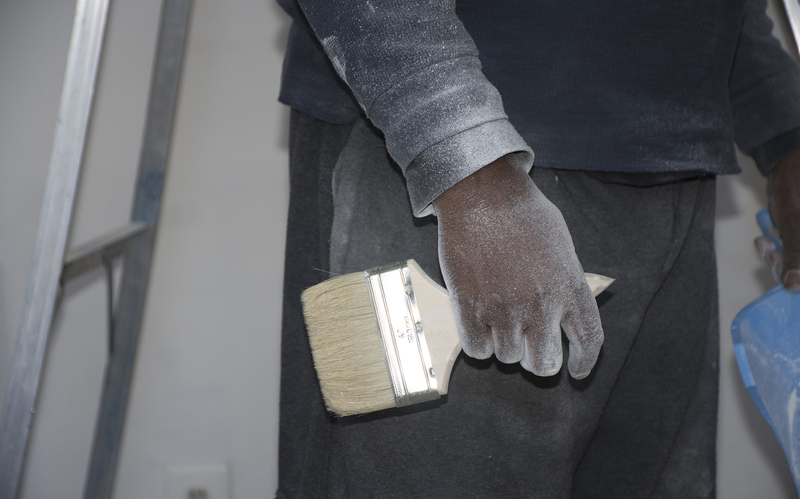 Selling art can be an ebb and flow business, so African Robert doesn’t always have the rent. And Fancy Robert also knows that African Robert spent seven years in prison on heroin-related drug charges. But from a practical viewpoint, Fancy Robert sees his first floor tenant as a 21-year resident of the building who provides stability and safety at street level because people respect who he is. An added bonus is an occasional sniper of African Robert’s musical past. “Sometimes late at night, I can hear him playing the saxophone. He is good but he rarely performs any more. He needs the right setting,” the landlord says. Down below, at street level, African Robert surveys the neighborhood he has called home for more than two decades. He understands the problems. “I am tired of seeing this city die a slow death,” he says. But he also sees improvement in the building above him and in the neighborhood around him. “Finally some life is getting injected back into it,” he says.